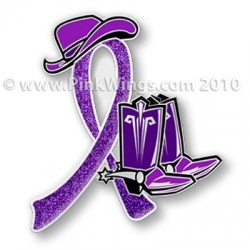 This is a 1 1/4" purple ribbon pin. The purple is glitter and really shines bright in the sun! The purple ribbon represents Pancreatic Cancer Awareness, Relay for Life and all cancer awareness. This pin is also available in Teal (for Ovarian Cancer Awareness) and Pink. Please choose color from drop down menu. This pin is available in bulk for fundraising. This pin was created for our BBQ Cook-Off for PanCan out here in Arizona. It is sooooo cute! Thank you Courtney ~ you are AMAZING!